I am not sure why it took me so long to try cooking Quinoa. I’ve had this bag of it sitting in my pantry for a couple of months now. I guess I was worried it would be tough to cook, or maybe Diana would not like it or I would not like it… Sure, I’ve had it once before, at El Bulli in Spain of all places, but it was such a small sample and I did not remember exactly how it tasted. Today was the day though. 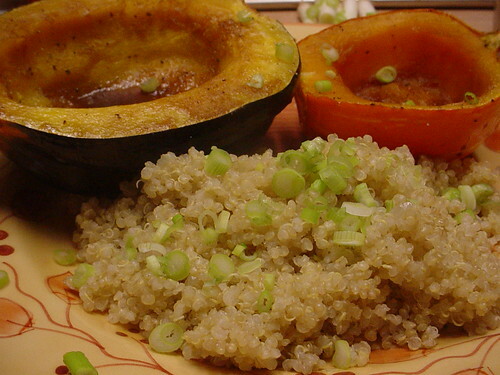 I roasted some winter squash and glazed them with soy, ginger and maple syrup following a Cook’s Illustrated recipe and made quinoa to go with them. I used a basic recipe in Bittman’s vegetarian book. It could not have been simpler and cooks pretty fast. I sautéed the tiny grains in some olive oil with onions and added twice the amount of quinoa in water. Let it simmer, cover and cook. Very much like making rice. The result was excellent and appreciated by everyone. The quinoa was fluffy and tender with a bit of texture. The taste was mild and very slightly vegetal. I will by using it instead of rice in many dishes in the future. The squashes? Of course these were great. 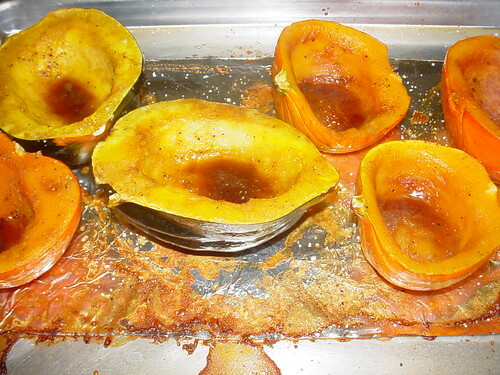 I love them in all their varieties, here I used an acorn squash and a couple of baby pumpkins.